A few years ago, I created a video and blog post called Does Your Framework Support Your Flow? in which I talk about the need for both a ‘Framework’ which represents our masculine essence and ‘Flow’ which represents our feminine essence. Click the link to watch the video and get tips on creating framework or structure to support and give freedom to the organic feminine flow that wants to be expressed through you. We need both a container and some form of structure for our life, in relationships and work in order for us to truly thrive. Some simple agreements in relationships act as a form of structure as does creating a clear framework such as a website, blog or book for our words and work in the world. As I demonstrate in this video, water needs a spacious container to flow freely where there is some kind of structure but also the spaciousness to move, be spontaneous and organic; such is the nature of feminine flow. After ‘putting out’ the information on the next 5 Week Immersion series which is usually a closed group, I began to feel that I needed to open this particular series to allow new women to come and experience classes. Through listening to this need, I opened the ‘structure’ to allow this feminine element to flow. So it is possible to come to one, two, three or more classes of this series. Body awareness practices that help women ‘be at home’ in their bodies—no matter what stress is occurring around them. 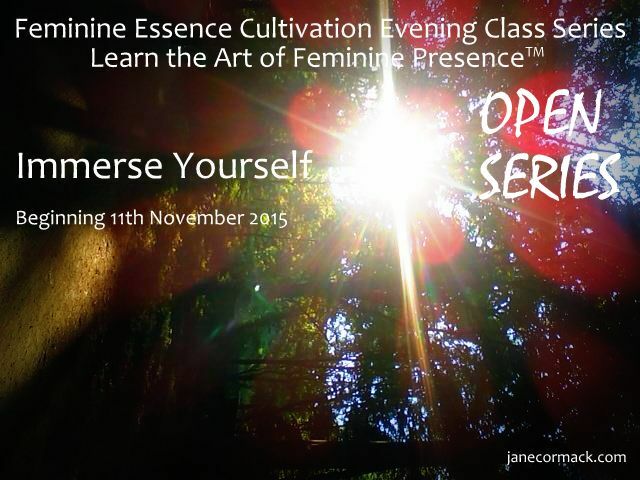 The first class is coming up this Wednesday 11th of November with a focus on feminine and masculine polarity and how this is experienced within ourselves and expressed in our lives and relationships. To join this class RSVP directly on our Meetup group here > 11th November Class . You will be warmly welcomed. As we turn to autumn then winter, it’s incredibly nourishing to feel the deep connections made and the uplifting love from a circle of women; this is a huge part of the experience.